Discussion in 'Suspension And Brakes' started by Nix, Jun 13, 2013. If anyone has the progress bar or is thinking about getting one there are greaseable sway bar bushings available from energy suspension. These fit on the rear bar only, fit on the 8th gen, and since the sway bar is interchangeable these should be also. At around $15 it is a fairly inexpensive upgrade. If anyone purchases this part and confirms fitment post up here and let us know. mph, SlySi, Pauly99to17 and 4 others like this. UPDATE: I checked on the collegehillshonda site and the part numbers for the rear frame brackets that the bushings mount to are the same on the SI and non-SI. No one has to worry about swapping brackets or running extender hardware! Monk, webby and squiggy like this. Nice find. 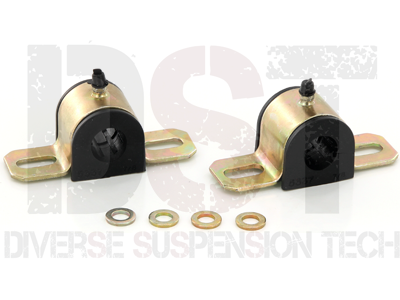 Anyone upgrading to a 22mm rear sway would be better off buying these vs stock Si brackets. Confirmation from MarkA that the upgraded bushings do in fact fit! It sounds like it might be necessary to replace the grease fitting with a 90 degree one on the left. ... I also used the Energy Suspension greaseable bushings...I can definitely confirm that they fit, but I don't know if it will be possible to use the grease fitting on the left bushing, as it doesn't clear the back of the fuel tank by very much. Ah, you beat me to it! I was just getting ready to put up a message here. As I posted in the DIY thread, I have a second pair of bushings. If anyone else is putting in a 22 mm bar, they're free for the asking. squiggy and Nix like this. I think squiggy has the 22mm. I'm not sure if he upgraded the bushings/bracket. Here is the left bushing. The gas tank is to the right. The end of the sway bar can be seen, out of focus, in the lower right corner of the picture. Yes, I used PLENTY of grease when assembling the bushing! Here is the right end of the bar. There is nothing blocking the grease fitting. At the bottom of the picture, you can see the stock end link, and the Progress-supplied reinforcement plate, with the shiny new bolt holding it, behind the mounting tab on the lower control arm. Monk, Nix and Dar-Dar like this. I upgraded the bushings and drilled the third bolt hole. Have not bought the brackets yet. However, since I will be under the car and tearing some things apart again, I wouldn't mind acquiring a set if MarkA still has them available. We're talking about the greaseable bushings (as shown in the pictures), yes? PM me your snail-mail address, and I'll send them out. If I were to get the Progress 22mm sway bar, would you guys recommend getting these bushings and get the moog endlinks as well? Also, is it safe to run the Progress sway bar alone without these bushings? I know they're cheap, but just a thought. I don't plan on tracking my car, would the Eibach 19mm suffice? I'd just like to further reduce body roll. You don't need anything other than the sway bar. However, in my opinion, for the modest price they are well worth the upgrade. That is exactly what I was thinking, but along with these, would you recommend picking up the moog endlinks as well? I also don't know if I should consider the progress or the eibach 19mm instead. I have all three. As far as the Moog endlinks, I like the ability to be able to grease the bushings as well as the fact that they are at least 50% thicker (guesstimate) than stock...which will add to the rigidity of the suspension. Hmmm, I hope its not overkill for a daily driver! May I ask where you purchased your Moog endlinks at and for how much? Amazon sells them for about $28 a side. I ordered all three at http://www.redshiftmotorsports.com/RedShift2012CivicSuspPackages.htm from RedShiftChris. HFP-ME, dtao819 and Nix like this. I did the Progress sway bar, greaseable bushings, but stock end links. I would definitely buy from RedShift Motorsports: it is owned and operated by a Honda enthusiast. The best reason to upgrade the endlinks is that the stock ones will be a bit rusty, and not shiny and new like the sway bar itself. The bushings that come with the sway bar are pretty solid. If I had it to do again, I'd probably pass on the bushings, and buy the Moog end links. HFP-ME and dtao819 like this. Best grease that can be used with the bushings?